TABUQ "Short - Saddam Hussein Representative" version, made by Al-Quadissiya Establishments in Iraq. 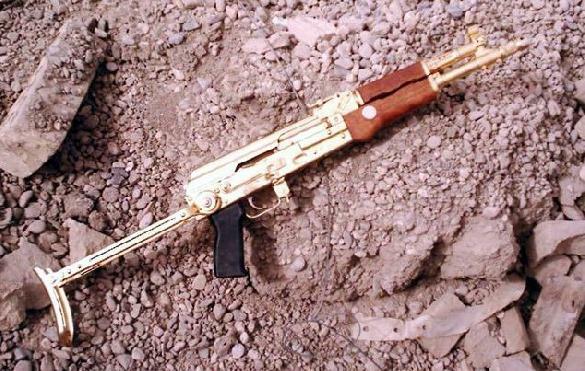 This is one of the in-famous Soddamn Insane's golden AKs. Fact is that ALL the Iraqi long guns are copied from the Yugo AKs. They probably also acquired machineries from ZAVODI ORUZJE CRVENA ZASTAVA (The "Zastava Arms" Plant), located in Kragujevac, south of Sarajevo, when the butcher Milosevic ruled on Yugoslavia. The Iraqi TABUQ assault rifle, in both its fixed-stock and underfolding-stock versions, is a copy respectively of the Yugoslavian-made ZASTAVA M-70 and M70-A rifles cache. The Iraqi AL-QUDS squad automatic weapon, in both its fixed-stock and underfolding-stock versions, is a copy respectively of the Yugoslavian-made ZASTAVA M-72 and M-72A machineguns cache. The Iraqi TABUQ "Match Grade" designated marksman weapon is a spin-off project of the Yugoslavian ZASTAVA M-76 sniper rifle. Thei Iraqi TABUQ "CARBINE" shorty assault weapon, in both its .7'62x39mm and .5'56x45mm is a copy respectively of the Yugoslavian ZASTAVA M-85 and M-90 short carbines. The only exceptions, between the Iraqi-made weapons, are the AL-KADISA sniper rifle, which is a copy of the Russian SVD, and the TARIQ .9x19mm and .32-ACP semiautomatic pistols, which respectively are copied from the Italian BERETTA M-951 and BERETTA M-70.